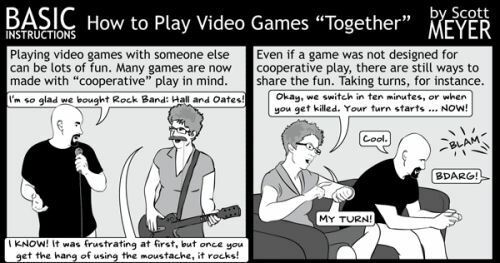 I was ecstatic to see that the latest comic tackles the one thing near and dear to our hearts here on Co-Optimus: co-op gaming. Whether it's passing the controller, playing Rock Band, or giving helpful tips to your partner; Basic Instructions lays it out for you in only the way Scott Meyer can. Page created in 0.7204 seconds.